Atlanta is currently snowbound. After a day of total gridlock, there are signs that things are slowly starting to move again, but it’s going to be a long way until things return to normal because the night temperatures are still well below freezing. Whatever melts during the day will soon freeze back up at night, but things are returning to normal. The daytime soap operas are running again instead of the breathless weather people reporting the same weather. The 18-wheel trucks are starting to creep out of town and soon life will be back to normal. Of course, that was not to be. It would be a full five days before Atlanta returned to anything resembling normality. Opinions about this sort of weather are mixed. 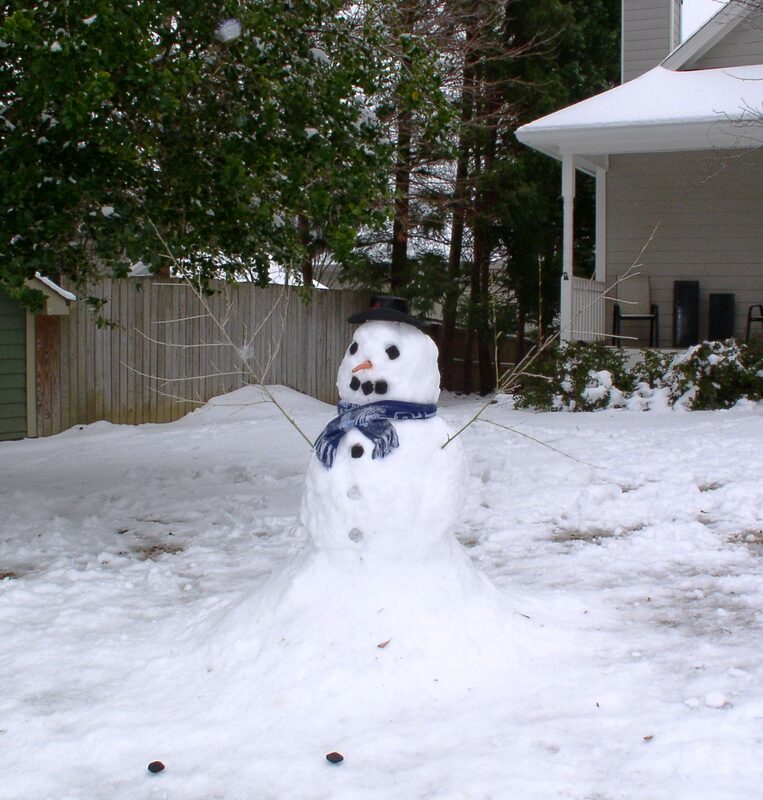 I still retain a child like attitude toward ice and snow in Atlanta. I guess that it has to do with the scarcity of snow; if I lived in Duluth, Minnesota, I suppose that snow would just be another issue that was addressed as part of day to day life. But, for me, it isn’t that way. I grew up in coastal Texas. I had seen snow before, in places like Winter Park, Colorado, but, on the whole, snow was a curiosity. That all would change in 1960, when a truly freak snow storm hit town at Christmas. And, I had just the toy to play with in the snow. It was a short and sweet storm, and that was largely my limited experience with snow until college in western Illinois. 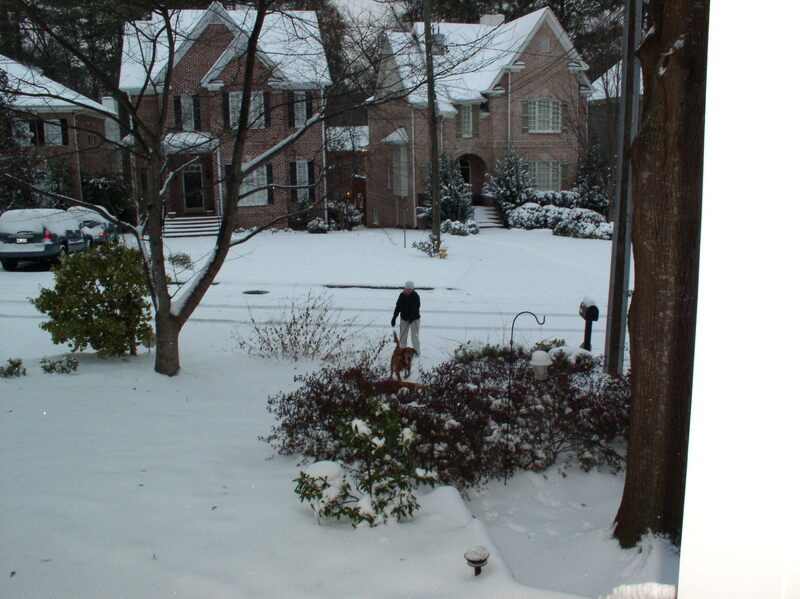 Once back in Atlanta after college, I fell into the sweet trap of Atlanta’s snow days. It’s not fair to call them snow storms, although they usually start off that way. What happens next is ice, and that changes the equation. Even with that, my approach is to slow down and take things easy until the weather event passes. Because everything shuts down, it is an opportunity to catch up on a good book or a hobby project. As long as the electricity stays on, we’re fine. In earlier times, even the electricity could go off and we would be fine, but now that we have a 98-year old mother living with us, things have changed just a bit. There are those who cannot stand the inconvenience of being held captive by the weather. Years ago, when Atlanta was, once again, in the grip of ice and snow, officials of the City of Atlanta intoned the mantra of “Atlanta is the next great international city. We will not close in the face of a weather event“. They droned on and on about this, and as a result, City of Atlanta employees had to struggle in to work. Once there, they sat around and did nothing because nobody else was coming into town in this sort of weather. No, as much as the financial geniuses want things to keep operating, that’s not the way to play it. I’m not one of those who try to control the snow. Be as the reed in the wind, bend but do not break. Ramping up to an anticipated storm, Atlanta goes just a bit nuts. In part, it is because Atlanta gets a mix of ice and snow. The ice forms on trees, which once laden with the heavy ice, fall and hit power lines, causing the city to go dark. Often for days, things stay that way, but it is more than that. Once word leaks out that an ice and/or snow storm is approaching, the grocery stores fill up with your neighbors. All of them have a slightly addled look; and a shopping buggy filled with six loaves of bread, three gallons of milk, potato chips, bean dip, steaks, fifty rolls of toilet paper and whatever other comfort foods that they feel are required to survive. Mind you, the longest that Atlanta has been out of action is a full week, but after one look at their grocery cart, you would think that the end times were near. In part, this seems to be a reflection of the red-state nature of Georgia, where people have limited expectations of what government should be expected to do for you. While Mayor Bloomberg gets in trouble for snow-blocked streets in the Brooklyn, Atlanta quietly prepares by stocking up with groceries, topping off the liquor tanks and settling in. Of course, a political spin was in play in New York. Meanwhile, Atlanta acts like its rural roots, hitching up Maud and Topsy to the buckboard and driving into town to get a month’s worth of groceries. Suit yourself, I’m prepared to wait things out and that’s that. Of course, the local television stations have a field day with any “weather event” (so-called). The radio people get in on the fun, too, but the poor print types are crippled since their form of entertainment cannot be distributed if the streets are closed with ice. Then they try to get away with delivering four days worth of newspapers and hope that you don’t notice. The TV news types switch into 24-Hour mode, sleeping on their desks between broadcast shifts. For them, it’s a grand adventure and time to drag out all that cool equipment that they wheedled out of management. There is radar and computer models, lots of pretty colors. One odd thing does happen which leads to misunderstanding. On the bottom of the television screen are crawls of school closings, canceled events and such. As the ice & snow days drag on, these crawls change to information about street and road closings. At first glance, it appears that DeKalb County is having a worse time of it than most. While the rural counties around Atlanta are reporting no road closings, DeKalb seems to be permanently iced in, with no roads passable. I eventually figure out that the problem is really based in the fact the DeKalb is being too good about reporting its problems. Even the City of Atlanta seems to be engaged in a weather related version of Don’t Ask, Don’t Tell. Over the years, there have been occasional temptations to move to frigid climes. I remember the first time that we went home meet my wife’s parents after our marriage. I was in the local Lowe’s and found myself in front of a real guy’s toy. It was a snow blower with a 5 HP Tecumseh engine, caterpillar treads and four headlights. I’m thinking to myself, gee maybe we could live in the north. Fortunately, I got over that; staying in and letting things melt is my way. In general, the safe play in Atlanta is to stay home until things melt a bit, watching the whole thing on television. There are those who snort that they can drive perfectly well in ice and snow; the problem is not them, it is the other drivers out there who cannot. I personally have driven in snow, and once you understand the necessary skills and don’t get in a hurry, then everything is mostly fine. That doesn’t mean that I want to do it. At the first hint of trouble, the airlines shut down. That’s the smart play, but where you fit into the travel hierarchy soon becomes apparent. The million-miler frequent fliers get telephone calls from their airline of choice, telling them that they will soon be canceling flights and wouldn’t you like to fly out to Vegas a day early to avoid the problems? The bulk of the flying public are left stranded in the airports or, if they’re lucky, at home. The only thing flying at all seem to be mostly international flights, once the runways are cleared and the de-icing equipment is dusted off. The local railroads, and, by extension, Amtrak just shut down for the duration. In many cases, the issue for the railroad is that once a train load of goods arrives in a snowbound city, what are they going to do with it? It is just better to wait in place until the situation resolves itself. For Amtrak, in Atlanta the number of passengers affected are low. Here you have a city of over four million souls that enjoys once a day passenger train service in each direction. And, the Crescent isn’t that big a train. It’s a sad turn of events for a city that once enjoyed both a Terminal Station and a Union Station. For bus passengers, the snow event will become even bleaker, with 150 people left stranded at the Atlanta bus station. There once was a time when the local bus station was an art deco styled building in the heart of downtown. Now it is a bland collection of prefab buildings adjacent to the Atlanta city jail. Although there is a MARTA station nearby, the bus passengers are left stranded when Greyhound and Southeastern Stages shut down because of the weather. After a day of isolation, eventually the City of Atlanta and Greyhound reach some sort of arrangement and these lost souls are provided for. Certainly a great contrast to the treatment of high-flying frequent airline travelers. They know the snow and ice are coming. The Georgia State Patrol issues alerts that trucks should not try to drive through Atlanta during ice storms. And, still they come. And, when they come, they fold up into an undrivable entity that not only stops them, but everybody else. There is little logic that can explain why this repeatedly happens. 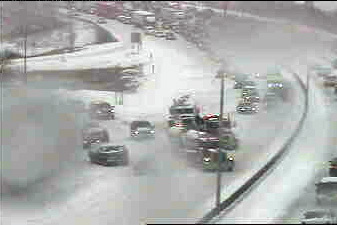 In spite of official warnings, the trucks still drive on into the mess and then snarl things up for days. The drivers of heavy duty tow trucks make a small fortune. The truckers that have sense to stop when things get hazardous, usually do so right in the middle of an Interstate. They, and their countless brethren, have holded up in their cozy sleeping accommodations just behind the cab of the tractor which they drive. And, why not? There’s a nice place to sleep, food preparation facilities and satellite television. No matter that they have closed the roads…. One of the outcomes of the most recent snow & ice storm has been official action as to who is really in charge of handling the State’s response to a weather emergency. Stay tuned for the outcomes, but one key player is the State Department of Transportation. 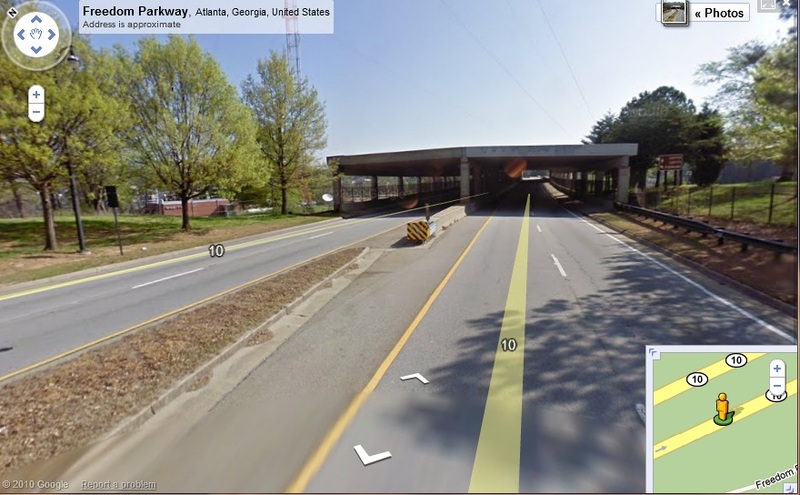 This mass of concrete was built to protect the drivers on Freedom Parkway during ice storms. The highway passes under guy wires for a television station’s transmitting antenna. It was assumed that ice would form on the wires during ice storms and then fall off during the subsequent thaw, potentially damaging cars traveling on the Parkway. So, the Georgia Department of Transportation erected this magnificent edifice that is functional only for two or three days each year. Of course, it would have been cheaper to just place $500.00 worth of barricades to stop traffic for these few days each year, but the Georgia DoT doesn’t think that way. Rightly or wrongly, the DoT has been the defacto leader in weather emergencies. Which has not necessarily been a good thing. They currently are the focus of critical attention right now, and with due cause. For the local television stations, contacting the DoT can be an iffy proposition. Certainly, they have official spokespeople who stand in front of the camera with snowplows rumbling by in the background and intone the Department’s official line. In other cases, reaching them by telephone can yield extremely interesting interviews about emergency transportation issues. In one case, a local station called the DoT, but seemingly got misdirected to a call center in Bangalore with a DoT spokesperson for whom English was a third language. In another case, as the recent weather emergency wore on, the media got connected to someone who said that the best thing for most people was to stay at home and enjoy their families and a good book. The truth hurts. Certainly, the weather emergency was indeed an opportunity for families to get to know each other. One thing soon became apparent in our neighborhood. There are a lot of people who know how to cook and bake. As the week wore on, supplies of butter, sugar, chocolate and flour began running dangerously low. Now, with the weather much warmer and sunnier, the media have moved on to other issues to help sell advertising time. First, it was the fact that all that gritty sand that was spread to prevent slipping and sliding is now going to wash down into the storm sewers where it will clog things up. Once everybody adapted to that, then the little reflector pieces used to identify traffic lanes became an issue. Since the DoT trucks were driving about clearing the roads of ice, they also were clearing the roads of the little reflectors. Various TV sources priced these reflectors at either $2.00 apiece or $4.00 apiece. Regardless, countless numbers of these reflectors have been scraped from the highways and must be replaced. I’m sticking around to see if that’s true.